When Arsene Wenger called time on his almost 22-year reign as Arsenal manager, there was a cloud of uncertainty hovering over the club. Many a fan were worried of what would happen next after such a long tenure of one man at the helm. Everyone remembered very well what had happened to Manchester United following the departure of their legendary manager, Sir Alex Ferguson, in 2013, who, like Arsene Wenger, had spent more than two decades at the Old Trafford club. Since 2013, United haven't had a sniff at the title Ferguson had got them used to winning and their two-decade dominance clearly dissipated! Arsenal had no such dominance, but it was the uncertain future the Gunners fans utterly dreaded. Unlike United, Arsenal had clearly prepared for the inevitable before it actually happened. In his address to Arsenal Supporters Trust in 2017, Chief Executive Ivan Gazidis promised drastic changes that would catapult the club to future success. Indeed the Gunners Supremo wasted no time in putting together a team of experts with whom to oversee a smooth transition from the Wenger era to a new Arsenal under a new manager. Sven Mislintat, Raul Sanllehi, Huss Fahmy were brought in to share the responsibilities hitherto possessed by one man, Arsene Wenger. It was this team that helped appoint former Sevilla and PSG manager, Unai Emery, and so a new dawn at the club had begun! Truth be told, Arsenal had stagnated under Wenger, with a lot going wrong at the club. The transfer market had become an absolute shambles with the manager continually and perhaps deliberately failing to address the major flaws in the squad. Since the departure of Gilberto Silva, Arsenal had failed to buy a true defensive midfielder in the real sense of the word. Pretenders such as Francis Coquelin, Alex Song, Mikel Arteta, Granit Xhaka, et al, all tried and failed to make the anchorman role their own, leaving the defense desperately exposed. Shipping 51 goals in the league last season was despicable and was indeed a true testament to that. In big matches in England and in Europe, Arsenal were always found wanting, conceding ridiculous numbers of goals. 8-2 to Manchester United, 6-0 to Chelsea, 5-1 to Liverpool, 6-2 to Manchester City and the 10-2 aggregate loss to Bayern Munich in Arsenal's last Champions League participation to date are some of the very many humiliations Arsenal have had to contend with in recent seasons under Wenger. All that pointed towards the fact that with football evolving, Wenger refused to evolve with it tactically, and managers who did always outthought him and beat Arsenal almost every time they played. Clearly, Arsene Wenger had become this stubborn grandfather-like manager, paying no attention to tactics and work ethic. No wonder his teams were always outfought even by teams they were supposed to bully. On the other hand though, Unai Emery represents a kind of coach of the 21st century. Emery is tactically astute, vocal and animated in the dugout, extremely meticulous in his preparation for matches. He spends hours studying videos of the next opponent to identify their strengths and weaknesses, as well as ways to outwit them. Little wonder, therefore, that Victor Manas, one of his backroom staff is a data and video analyst! Regarding the transfer market, Emery has wasted no time in addressing the problem areas that Wenger openly ignored. Bernd Leno has been brought in to replace the erratic Petr Cech, who made 7 mistakes that resulted in goals last season, more than any other keeper in the league. Sokratis Papastathopoulos and Stephan Leichtsteiner have come in to shore up the defense, while Uruguay's midfield linchpin Lucas Torreira and French young gun Matteo Guendouzi have also been brought in to address the apparent problem in midfield. 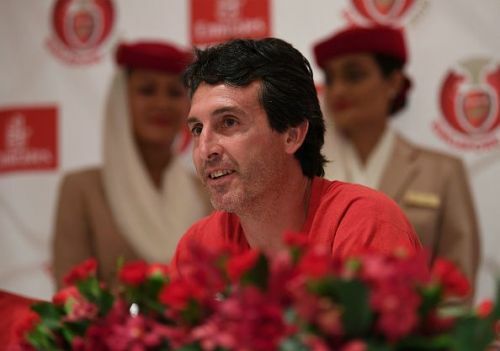 By design, Emery brought in experienced heads in Lichtsteiner and Papastathopoulos to offer leadership, experience and mental strength, attributes Arsenal have been accused of lacking for a number of years. All these deals have been concluded before the start of preseason, unlike the old days when any deals would be done on deadline day, with no time to gel! I'm convinced if Wenger was still at the helm, Santi Cazorla would still be at Arsenal, so would Jack Wilshere, players who would never guarantee any reliability in terms of their health. It was bold of Unai Emery to let them move on, an indication of a manager who means real business and not put faith in players whose health records do not make for good reading one bit. The training sessions are reportedly much more intense with great emphasis on team shape and tactics. The appointment of Unai Emery has not only re-energized the players but also the fans who, under Wenger had lost hope, waiting for a loss or two to pull out their placards calling for manager's head! There's real optimism at the Emirates and the fans can't wait to see the season start. Verily, Arsenal have moved out of their slumber into real business!